The Chesterwye Foundation recognizes that people have different levels of skill and ability when entering the workplace. By providing proper supervision, counseling and "real life" experience, adults with intellectual disabilities contribute significantly in the working community. Chesterwye's Vocational Program provides opportunities for individuals to gain confidence, self-esteem and independence. They also learn the value of earning a paycheck. Whether employment is full time or part time, Chesterwye believes in the value of productive work. Upon completion of job training, individuals are evaluated for various employment opportunities. They also have the opportunity to choose where they would prefer to work. For example, Chesterwye currently provides cleaning services to over 20 locations in Queen Anne's and Talbot County. 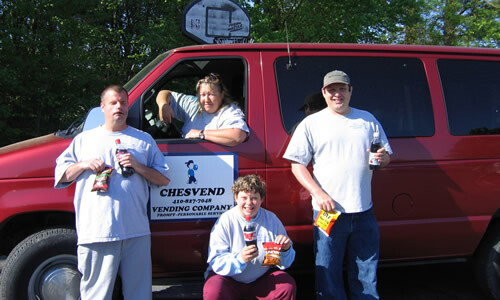 Chesvend, a vending machine company, owned and operated by the "Individuals of Chesterwye" services over 60 soda and snack machines across three Eastern Shore counties. Other employment opportunities include Safeway, local Real Estate companies, Queen Anne's County School System, Senior Citizen Homes, Day Nurseries, Greenhouses and Hotels. Chesterwye Center, Inc. is a 501(c)(3) nonprofit organization. Copyright & 2009, Chesterwye Center, Inc. All rights reserved.Chesterwye Center, Inc. is a 501(c)(3) not-for-profit organization. Donations are tax deductible to the fullest extent allowed by law. A copy of our current financial statement is available upon request by contacting Chesterwye Center, Inc. at P.O. Box 96, Grasonville, MD. 21638. Documents and information submitted to the State of Maryland under the Maryland Charitable Solicitations Act are available from the Office of the Secretary of the State for the cost of copying and postage.